How Cyber Aware is your business? Recent high profile cyber attacks on both companies and individuals across the globe show just how vital it is to ensure that all connected devices are kept as secure as possible. To highlight just how important cybersecurity is to businesses in the UK, Vistage UK have partnered with the Home Office’s Cyber Aware campaign. What does a cyber attack look like, and why do they happen? Watch our video below to find out - or scroll down for a full transcript. 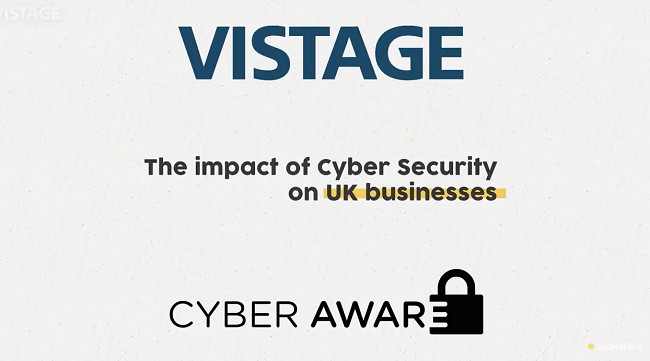 Vistage UK have partnered with the Home Office's Cyber Aware campaign to highlight the importance of cybersecurity for UK businesses. Recent research from the Department for Digital, Culture, Media & Sport shows that 66% of medium-sized businesses had identified a security breach or attack in the past year. Among those that had suffered a breach, nearly 50% needed new preventive measures, and used additional staff time to deal with breaches. So what is a cyber attack, and why would a business be targeted? We spoke to a number of cyber security experts to find out more. “A cyber attack could be anything that's targeting your IT systems. It could be someone looking for data: so names, email addresses, social security numbers, passwords, credit card details. That data is valuable and can be sold on on the black market, so criminals will often be after data like that. “There are a number of reasons why businesses could become targets for cyber attack. You could hold valuable information that someone wants to steal, like credit card details or personal information, or there could be a political or ideological reason that makes a particular organisation a target. You might have a particular vulnerability that's been identified and someone decides to exploit it just because they can in order to see what they find. Some of the high profile cyber incidents that we've seen this year were possible because of known vulnerabilities and the fact they are exploited, for instance, Microsoft released an update to correct the WannaCry vulnerability two months before the incident began. The average cost of a security breach for a medium-sized business is over £3,000, and over £19,000 for a large business. However, the cost is much greater than just financial. So, as a business leader, what can you do to be prepared and protected? “We know from research done by GCHQ and others that the vast majority of attacks are very basic. Criminals aren't going to launch a sophisticated attack on your business if they can walk in through the front door, so what you really need to do is assess what's most important to you and protect it. “I think the important thing is to have a plan and it might be very simple: it might just be, ‘this is who we are going to call if we have a problem’, perhaps a third party company that you work with that provides your internet services. It's having a plan of what you would do - what would be your backup plan? For more information on Cyber Aware and the Cyber Essentials scheme for businesses, visit cyberaware.gov.uk.